Pinay WAHM: Benazir Bhutto was Assasinated! Benazir Bhutto, a former Pakistan Prime Minister was assasinated minutes after she addressed thousands of her supporters. She was in the car already leaving the venue when her supporters at the gate started chanting their support for her. So she came out of the vehicle to acknowledge them. Tha's when an assassin shot her in the neck and body then blew himself up. Here's a picture of her waving at her supporters minutes before she was gunned down. Personally, I had a case of the deja vu when I read this news. Bhutto just returned to Pakistan on October 18, 2007 from an 8-year exile. Now, isn't that something similar to what happened to Benigno 'Ninoy' Aquino in 1983? Ninoy Aquino was assassinated on his way back to the Philippines from 3 years of self-imposed exile here in the states....while he was still on the plane that brought him home for the last time. Aquino's assassination eventually brought down the 20-year Marcos regime and catapulting his wife's, Cory Aquino, win for Presidency thus making her the first woman Philippine president. Would Benazir Bhutto's assassination do the same with the present Pakistan President? That we have to wait and see. 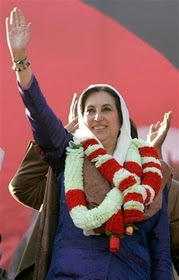 Benazir Bhutto's photo courtesy of Yahoo News.